Load. Transfer. Screen. Extract. Return-to-use metal powders with high bulk densities at high rates. 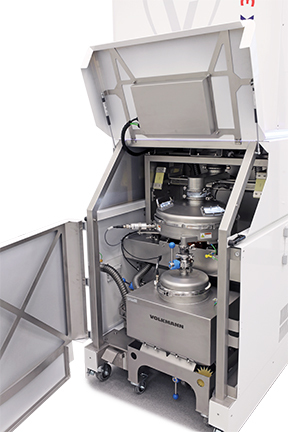 The Volkmann PowTReX systems are designed specifically to enhance additive manufacturing technology when handling metal powders or toxic materials by providing safe transfer, recovery and extraction and return-to-use of materials with high bulk densities at high rates. 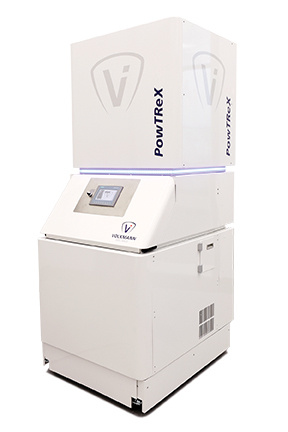 Recognizing the need to improve efficiencies in the additive manufacturing environment, Volkmann’s PowTReX eliminates needless waste of costly metal powders while maintaining a safe, contained environment for vacuum conveying of metal powders. Operating at throughputs of above 1100 lbs/hr for stainless steel, and above 660 lbs/hr for aluminum powder, PowTReX keeps the additive manufacturing operation running at peak efficiency. PowTReX is capable of handling metals and materials such as tungsten, cobalt, silver powder, iron, stainless steel, alumina, nickel chrome, copper, chrono K20, carbide dust, corundum and G.62 with bulk densities ranging from 93 to 341 lbs/ft3. The PowTReX works in both a normal air environment and under an inert gas. 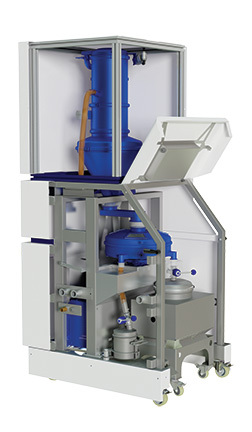 Where inert transfer is required, the system is designed in a “closed loop” so that inert gas is both contained and reused, avoiding the additional cost of large volumes of inert gas. In this version, a special configuration gas-tight electric pump is used to maintain system temperature and containment.